The one thing people got to take home from this past Saturday’s outing is that it’s time for something new. Now it’s time to explain. The one thing I’ve known for my whole life is that there are a lot of great things out there. Sure, that’s a general statement, and naturally, food is the main thing that comes to mind for people who are reading. In the last three years of writing this blog and focusing on food, I’ve had a lot of fun developing chronicles of my dining experiences (good and bad), but one thing I haven’t really done is focus on highlighting stuff that is truly great. 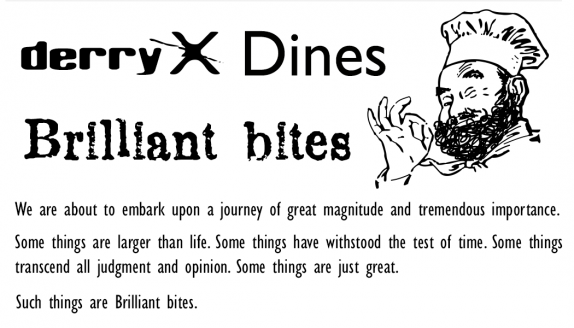 I think reading detailed restaurant reviews are really helpful for people who are trying to gather data to tailor their own experiences; that’s part of the reason that derryX Dines has gained a lot of momentum in recent years. The focus of “Brilliant bites” will be to carve out a space on the internet where the really great things can be celebrated. So what makes something eligible to be highlighted as a brilliant bite? Here are the types of things I’d like you to consider when coming up with your examples of brilliant bites. Foods that have stood the test of time. Dishes that the chef has put forth obvious effort to create and refine. If you own a food business, foods that you’d get in trouble for taking off your menu. Foods that you can’t get anywhere else. Foods that have broad appeal. Foods that people will travel from afar to experience. They don’t have to meet all criteria. They don’t even have to be from a local source. You can tell me about something awesome you had while visiting Japan or something you bought in a supermarket that was so crazy amazing that you had to tell someone. It should a specific dish or product, so, for example, if you write “Saigon Springs” on a piece of paper and hand it to me, I’m likely to dismiss it or ask for more information. I want this to break down the barriers that people would have to trying new things. From things people read on the web, no matter how great things are, physical barriers inhibit people from enjoying experiences. You read about things all the time that could be the most amazing things in the world, but, to experience them, you need to brave a terrible neighborhood or enter a fine dining restaurant where you’d never be found dead. What I want Brilliant bites to be is a resource where people from all walks of life can see a wide variety of awesome things and see that they’re worth whatever effort (if any) is required to enjoy them. It’s not about being pretentious. It’s not about being critical. And it’s not about going through tremendous lengths to find something great. It’s about emphasizing outstanding foods that you encounter in the course of normal life. These posts aren’t going to be particularly elaborate. I’ll have some pictures, and provide a little background about each thing. I’ll even give enough of an explanation of what you’re in for if you try it, but I’ll abstain from technical criticism. Actually, I’m not entirely sure that I’ll be writing all of them; this may be a great opportunity to get some reader participation. Above all, I want this to be something fun. I want people to really anticipate what the next brilliant bite will be and to seek out these things. If you see something listed as a brilliant bite, it’s because a lot of people wanted it to be there, and you better believe it’s worth it! Cornell’s “Chicken In The Oven”. The 45 minute one. There has to be a slot for a great tuna melt on a fresh bialy with the albacore tuna sitting on a fresh slice of summer tomato and a slice of Colby Jack melted on top. Baltimore Bagels in La Jolla, Cal had the best I ever had.